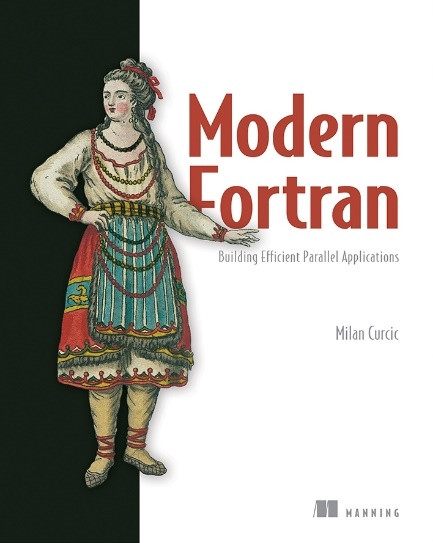 Take 37% off Modern Fortran. Just enter code fcccurcic into the discount box at checkout at manning.com. This article is Part 2 of a sequence on analyzing stock price time series with Fortran arrays. In Part 1, I covered the basics of declaring and initializing dynamic Fortran arrays. I also introduced the array constructors, which provide an easy way to allocate and initialize an array in a single line of code. If you haven’t yet read Part 1, I suggest that you go back and read it before moving on. In Part 2, we’ll learn how allocation and deallocation of Fortran arrays works in depth, allowing you to allocate arrays with arbitrary ranges (start and end indices). You’ll also learn how to slice the arrays in any direction and with custom stride to subset exactly the elements that you need. Finally, in this part we’ll apply this knowledge to implementing a solution to our first challenge – finding the best and worst performing stocks. integer :: im = 5 ! Notice that I know used a colon (:) between is and ie to specify the range. This range is inclusive (unlike in Python! ), so the size of a is now ie - is + 1, in this case 16. You can use intrinsic functions lbound and ubound to get the lower and upper bound, respectively, of any array. mold – a variable or an expression that has the same type as the object being allocated. source – equivalent to mold, except that the values of source are used to initialize the object being allocated. Style Tip: No matter how you choose to allocate your arrays, always initialize them immediately after allocation. This will minimize the chance of accidentally using uninitialized arrays in expressions. While Fortran will allow you to do this, you’ll likely end up with gibberish results. You may have noticed that when describing the array constructors earlier, I initialized arrays without explicitly allocating them with an allocate statement. Why did I do that? You may rightfully ask, do I need to explicitly allocate arrays or not? Since Fortran 2003, there has been a convenient feature of the language called allocation on assignment. This feature is particularly useful when trying to assign an array that is a result of a function, and whose size is not known ahead of time. There is another important difference between explicit allocation with the allocate statement and allocation on assignment. The former will trigger a runtime error if issued twice, that is, if you issue an allocate statement on an object that is already allocated. On the other side, the latter will gracefully re-allocate the array if already allocated. To be able to effectively reuse dynamic arrays, Fortran gives as a counterpart to the allocate statement which allows us to explicitly clear the object from memory. After issuing deallocate, array a must be allocated again before using it in the right-hand side of expressions. We’ll apply this mechanism to reuse arrays between different stocks. An allocatable array is automatically deallocated when it goes out of scope. For example, if you declare and allocate an array inside of a function or subroutine, it will be deallocated on return. Much like it is an error to allocate an object that is already allocated, it is also an error to deallocate an object that is not allocated! In the next section I explain how you can check the allocation status so that you never erroneously allocate or deallocate and object twice. Otherwise, there is no restriction with regard to whether the array has been initialized or not. You are free to deallocate an uninitialized array, for example if you learn that the arrays is not of the expected size, or similar. Style Tip: Deallocate all allocatable variables when you are done working with them. Figure 2 illustrates a typical life cycle of a dynamic array. Figure 2: A life cycle of a dynamic array. We first declare the array as allocatable. At this point, the array is not yet allocated in memory and its size is unspecified. When ready, we issue the allocate statement to reserve a chunk of memory to hold this array. This is also where we decide the size of the array or the start and end indices (in this example, 3 and 8). If not allocating from another source array, the values will be uninitialized. We thus need to initialize the array before doing anything else with it. Finally, once we’re done working with the array, we issue the deallocate statement to release the memory that was holding the array. The status of the array is now back to unallocated, and is available for allocation. A dynamic array can be reused like this any number of times, even with different sizes or start and end indices. This is exactly what we’ll do in our stock price analysis app. For each stock, we’ll allocate the arrays, use them to load the data from files, work on them, and then deallocate them before passing them on to the next stock. Trying to allocate an already allocated variable, or to deallocate a variable that is not allocated, will trigger a run-time error. Style Tip: Always check for allocation status before explicitly allocating or deallocating a variable. stat – an integer that indicates the status of the allocate statement. stat will be zero if allocation was successful, otherwise, it will be a non-zero positive number. errmsg – a character string that contains the error message if an error occurred (such as stat being non-zero), and is undefined otherwise. By using the built-in exception handling, you get the opportunity to decide how should the program proceed if the allocation fails. For example, if there is not enough memory to allocate a large array, perhaps we can split the work into smaller chunks. Even if you want the program to stop on allocation failure, this approach lets you handle things gracefully and print a meaningful error message. Style Tip: If you want control over what happens if (de)allocation fails, use stat and errmsg in your allocate and deallocate statements to catch any errors that may come up. Of course, you’ll still need to tell the program what to do if an error occurs, for example, stop the program with a custom message, print a warning message and continue running, or try to recover is some other way. I think we should use the built-in exception handling in our stock analysis app. However, we’re going to need this for several arrays. This seems suitable to implement once in a subroutine, and then reuse it as needed. Explicitly allocating and deallocating arrays can be quite tedious. This is especially true if you decide to make use of the built-in exception handling. If you’re working with many different arrays at a time, this can quickly build up to a lot of boilerplate code. Check if input array is already allocated, and if yes, deallocate it before proceeding. Allocate the array with input size n.
If an exception occurs during allocation, abort the program and print the error message to screen. The code is very similar to alloc except that here, at the start of the executable section of the code, we check if a is already allocated. If not, our job here is done and we can return immediately. These subroutines are also part of the stock-prices repository. You can find them in stock_prices/src/mod_alloc.f90, and are used by the CSV reader in stock_prices/src/mod_io.f90. We’ll use these convenience subroutines to greatly reduce the boilerplate in the read_stock subroutine. To find the length of the arrays before I allocate them, I inquire the length of the CSV file using a custom function num_records, defined in stock-prices/src/mod_io.f90. If you’re wondering what the number 1 means in the 1 close(fileunit), it’s just a line label that Fortran uses if and when it encounters an exception in the read(fileunit, fmt=*, end=1) statements. If you’re interested about how this function works, take a look inside stock-prices/src/mod_io.f90. I won’t spend much time on the I/O-specific code here, as we just need it get going with the array analysis. On every subroutine entry, the arrays time, open, high, low, close, adjclose, and volume will be allocated with size nm. The subroutine alloc now seamlessly reallocates the arrays for us. Notice that we still use the explicit way of allocating and deallocating the array of time stamps. This is because we implemented the convenience subroutines alloc and free that work on real arrays. Because of Fortran’s strong typing discipline, we can’t just pass an array of strings to a subroutine that expects an array of reals. We’ll learn later how to write generic procedures that can accept arguments of different type. For now, explicitly allocating the array of time stamps will do. Furthermore, we also need to specify the string length when allocating the time array. Having read the CSV files and loaded the stock price arrays with the data, we can move on the the actual analysis and fun with arrays. If you’re curious how the num_records function is implemented, feel free to take a look in stock-prices/src/mod_io.f90. This function opens a file and counts the number of lines by reading it line by line. The reverse function will prove useful for the other two objectives of the stock-prices app. Before implementing it, we need to know a few things about how array indexing and slicing works. To select a single element, we enclose an integer index inside the parentheses, for example adjclose(1) will refer to the first element of the array, adjclose(5) to the fifth, and so on. In this case, subset will be automatically allocated as an array with 6 elements, and values corresponding to those of adjclose from index 5 to 10.
where start, end, and stride are integer variables, constants, or expressions. start and end can have any valid integer value, including zero and negative values. stride must be a non-zero (positive or negative) integer. If stride is not given, its default value is 1. If start > end and stride > 0, or if start < end and stride < 0, the slice is an empty array. If start == end, for example a(5:5), the slice is an array with a single element. Be careful not to mistake this for a(5) which is a scalar (non-array). Furthermore, if start equals the lower bound of an array, it can be omitted, and same is true if end equals the upper bound of an array. For example, if we declare an array as real :: a(10:20), then the following array references and slices all correspond to the same array: a, a(:), a(10:20), a(10:), a(:20), a(::1). The last syntax from this list is particularly useful when you need to slice every n-th element of the whole array – it’s as simple as a(::n) If you have experience with slicing lists in Python, I bet this feels familiar. Let’s write a function reverse that accepts a real 1-dimensional array as input argument, and returns the same array in reverse order. We’ll use array slicing rules to perform the reversal. Notice that our input array doesn’t need to be declared allocatable. This is the so-called assumed-size array and it will take whatever size array is passed by the caller. We can use the information about the size directly when declaring the result array. You may be wondering why make this a separate function at all when we can just do x(size(x):1:-1) to reverse any array. There are two advantages to making this a dedicated reverse() function. First, if you need to reverse an array more than a few times, the slicing syntax above soon becomes unwieldy. Every time you read it, there is an extra step in the thought process to understand the intention behind the syntax. Second, the slicing syntax is allowed only when referencing an array variable, and you can’t use it on expressions, array constructors, or function results. In contrast, you can pass any of those as an argument to reverse(). This is why we can make such a test like all(x == reverse(reverse(x))). Try it! Take some time to play with various ways to slice arrays. Try different values of start, end, and stride. What happens if you try to create a slice that is bigger than the array itself? In other words, can you reference an array out-of-bounds? Be very careful to not reference array elements that are out of bounds! Fortran itself doesn’t forbid this, but you will either end up with an invalid value or with a segmentation fault, which can be particularly difficult to debug. By default, compilers don’t check if an out-of-bounds reference occurs during run-time, but you can enable it with a compiler flag. Use gfortran -fcheck=bounds and ifort -check bounds for GNU and Intel Fortran compilers respectively. Keep in mind that this can result in significantly slower programs, so it’s best if used during development and debugging, but not in production. From this output, we can see that Amazon had the largest absolute gain of $1512.16 per share, and Hewlett-Packard had the smallest gain of only $1.55 per share. However, the relative gain is more meaningful then the absolute amount per share because it tells us how much has the stock gained relative to its starting price. Looking at relative gain, Nvidia had a formidable 6864% growth, with Apple being the runner up with 5192%. The worst performing stock was that of Cisco Systems (CSCO), with only 4% growth over this time period. You can read the full program in stock-prices/src/stock_gain.f90. 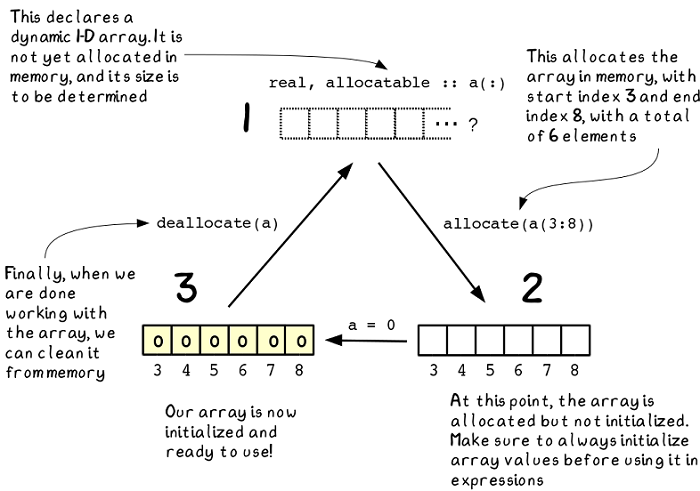 We have now covered a lot of the nitty-gritty of how arrays work. We’ll use this knowledge in Part 3 of this article sequence to implement solutions to the remaining two stock price analysis challenges. In this article, we continued from where we left of at the end of Part 1, and dug deeper into the mechanics of allocation and deallocation of dynamic Fortran arrays. We covered allocating arrays with arbitrary index ranges, and saw how we can slice and dice through the arrays with custom strides. In this article we also implemented the solution to the first of the three challenges. In the third and final part of this sequence, we’ll use built-in Fortran functions and whole-array arithmetic to calculate metrics such as moving average and standard deviation. We’ll use these to tackle the remaining two challenges – identifying which stocks are riskier than others at any given time, and finding good times to buy or sell stock.